Die Sägepalme hat dunkelrot gefärbte Früchte, aus denen Sägepalmextrakt gewonnen wird. Die Sägepalme (Serenoa repens) wird seit Jahrhunderten verwendet, sowohl als Zutat in Lebensmitteln als auch als Heilpflanze und wird für ihre verschiedenen wohltuenden Wirkungen gelobt. Dieser Pflanzstoff ist eine klinisch geprüfte und wirksame Behandlung für die Symptome von gutartiger Prostatavergrößerung (benigne Prostatahyperplasie oder kurz BPH). In den Vereinigte Staaten gehören Präparate mit Sägepalme deswegen zu den meistverkauften pflanzlichen Nahrungsergänzungsmitteln. Auch in Italien und Deutschland wird dieses pflanzliche Therapeutikum bei gutartiger Prostatavergrößerung eingesetzt.1 Sägepalme hilft bei Nykturie (nächtlichem Harndrang, nächtlichem Wasserlassen) und kann sowohl eine Erleichterung und eine gute Nachtruhe als auch Prävention von Prostata-Problemen bieten.2,3,4,5,6 Studien sind bezüglich der Ergebnisse jedoch nicht eindeutig. Hier erfahren Sie, warum dies so ist und welche Sägepalmenpräparate tatsächlich effektiv sind. Nachtropfen des Urins nach dem Wasserlassen. Di Silverio F, D’Eramo G, Lubrano C, Flammia GP, et al. Evidence that Serenoa repens extract displays an antiestrogenic activity in prostatic tissue of benign prostatic hypertrophy patients. Eur Urol. 1992;21(4):309-14. Gerber GS, Kuznetsov D, Johnson BC, Burstein JD. Randomized, double-blind, placebo-controlled trial of saw palmetto in men with lower urinary tract symptoms. Urology. 2001 Dec;58(6):960-4; discussion 964-5. Ernst E. The risk-benefit profile of commonly used herbal therapies: Ginkgo, St. John’s Wort, Ginseng, Echinacea, Saw Palmetto, and Kava. Ann Intern Med. 2002 Jan 1;136(1):42-53. Gerber GS. 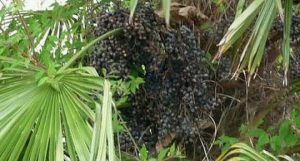 Saw palmetto for the treatment of men with lower urinary tract symptoms. J Urol. 2000 May;163(5):1408-12. Saidi S , Stavridis S , Stankov O , Dohcev S , Panov S . Effects of Serenoa repens Alcohol Extract on Benign Prostate Hyperplasia. Pril (Makedon Akad Nauk Umet Odd Med Nauki). 2017 Sep 1;38(2):123-129. doi: 10.1515/prilozi-2017-0030. Aaron L, Franco OE, Hayward SW. Review of Prostate Anatomy and Embryology and the Etiology of Benign Prostatic Hyperplasia. Urol Clin North Am. 2016 Aug;43(3):279-88. doi: 10.1016/j.ucl.2016.04.012. Underland V, Sæterdal I, Strømme E. Serenoa repens for Benign Prostatic Hyperplasia. Altern Ther Health Med. 2011;17(1):8-10. Wilt T, Ishani A, Mac Donald R. Serenoa repens for benign prostatic hyperplasia. Cochrane Database Syst Rev. 2002;(3):CD001423. Prager N, Bickett K, French N, Marcovici G. A randomized, double-blind, placebo-controlled trial to determine the effectiveness of botanically derived inhibitors of 5-alpha-reductase in the treatment of androgenetic alopecia. J Altern Complement Med. 2002 Apr;8(2):143-52. Klippel KF, Hiltl DM, Schipp B. A multicentric, placebo-controlled, double-blind clinical trial of beta-sitosterol (phytosterol) for the treatment of benign prostatic hyperplasia. German BPH-Phyto Study group. Br J Urol. 1997 Sep;80(3):427-32. Bartsch G, Rittmaster RS, Klocker H. Dihydrotestosterone and the role of 5 alpha-reductase inhibitors in benign prostatic hyperplasia. Urologe A. 2002 Sep;41(5):412-24. Preuss HG, Marcusen C, Regan J, Klimberg IW, Welebir TA, Jones WA. Randomized trial of a combination of natural products (cernitin, saw palmetto, beta-sitosterol, vitamin E) on symptoms of benign prostatic hyperplasia (BPH). Int Urol Nephrol. 2001;33(2):217-25. Lowe FC, Ku JC. Phytotherapy in treatment of benign prostatic hyperplasia: a critical review. Urology 1996;48:12-20. Briley M, Carilla E, Roger A. Inhibitory effect of Permixon on testosterone 5a-reductase activity of the rat ventral prostate. Br J Pharmacol 1984;83 (suppl):401P. Marks LS, Hess DL, Dorey FJ, Macairan ML, et al. Tissue effects of saw palmetto and finasteride: use of biopsy cores for in situ quantification of prostatic androgens. Urology 2001;57:999-1005. Marks LS, Partin AW, Epstein JI, Tyler VE, et al. Effects of a saw palmetto herbal blend in men with symptomatic benign prostatic hyperplasia. J Urol 2000;163:1451-6. Small JK, Bombardelli E, Morazzoni P. Serenoa repens (Bartram). Fitoterapia 1997;68:99–113. Altavilla D , Bitto A, Polito F, Irrera N, et al. The combination of Serenoa repens, selenium and lycopene is more effective than serenoa repens alone to prevent hormone dependent prostatic growth. J Urol. 2011 Oct;186(4):1524-9. doi: 10.1016/j.juro.2011.05.049. Epub 2011 Aug 19. Morgia G, Micali A, Rinaldi M, Irrera N, et al. Survivin and NAIP in Human Benign Prostatic Hyperplasia: Protective Role of the Association of Serenoa repens, Lycopene and Selenium from the Randomized Clinical Study. Int J Mol Sci. 2017 Mar 22;18(3). pii: E680. doi: 10.3390/ijms18030680. Morgia G , Cimino S, Favilla V, Russo GI, et al. Effects of Serenoa repens, selenium and lycopene (Profluss®) on chronic inflammation associated with benign prostatic hyperplasia: results of „FLOG“ (Flogosis and Profluss in Prostatic and Genital Disease), a multicentre Italian study. Int Braz J Urol. 2013 Mar-Apr;39(2):214-21. doi: 10.1590/S1677-5538.IBJU.2013.02.10. Minutoli L, Altavilla D, Marini H, RinaldiM, et al. Inhibitors of apoptosis proteins in experimental benign prostatic hyperplasia: effects of serenoa repens, selenium and lycopene. J Biomed Sci. 2014; 21(1): 19. Bonvissuto G , Minutoli L, Morgia G, Bitto A, et al. Effect of Serenoa repens, lycopene, and selenium on proinflammatory phenotype activation: an in vitro and in vivo comparison study. Urology. 2011 Jan;77(1):248.e9-16. doi: 10.1016/j.urology.2010.07.514. Epub 2010 Dec 15. Yan M, Song Y, Wong CP, Hardin K, Ho E. Zinc deficiency alters DNA damage response genes in normal human prostate epithelial cells. J Nutr. 2008 Apr;138(4):667-73. Festuccia C, Mancini A, Gravina GL, Scarsella L, et al. Antitumor effects of saffron-derived carotenoids in prostate cancer cell models. Biomed Res Int. 2014;2014:135048. doi: 10.1155/2014/135048. Epub 2014 May 11. Abdullaev FI, Espinosa-Aguirre JJ. Biomedical properties of saffron and its potential use in cancer therapy and chemoprevention trials. Cancer Detect Prev. 2004;28(6):426-32. Teiten MH, Gaascht F, Eifes S, Dicato M, Diederich M. Chemopreventive potential of curcumin in prostate cancer. Genes Nutr. 2010 Mar;5(1):61-74. doi: 10.1007/s12263-009-0152-3. Epub 2009 Oct 6.